2011 has undeniably been a fantastic year for alternative rock – or “distorted pop” – trio, The Xcerts. The hype for their latest full-length ‘Scatterbrain’ has slowly snowballed into this year, slowly but surely building into a rather hefty boulder which has seen the band support big boys like Manchester Orchestra, Young Guns and Scottish comtemporaries Biffy Clyro, festival spots at places like Hevy and releasing two EP installments; March’s ‘Stairs To Noise: The Scatterbrain EP’ and now this, ‘Slackerpop’. Originally setting out to be a single release, but now obviously bulked up into something more stand-alone and worth purchasing, this EP acts as a great entry point for any newly developed and acquired fans throughout the year. Leading title-track shows The Xcerts at their most catchy and infectious, almost like a common cold or any old STD, except you don’t mind being stuck with the song’s “oooh oooh oooh oooh” line in a loop around your head. However, it’s the additional new material that follows which is the main catalyst to own this EP. The generally far more stripped down and reworkings of some of some of their past releases displays the fine skeleton of songs like ‘Gum’ and ‘I See Things Differently’. It’s the new version of ‘He Sinks, He Sleeps’ though that is the most dominant piece on this 5-track. Murray Macleod’s vocals are at their most vulnerable and fragile state than they’ve ever been, and displays the core behind the band’s magic that is usually veiled by distorted guitars and layers of drums. Though this might not be the easiest starting point to get into The Xcerts, it’s definitely one of the most honest and is a great addition to any existing fan’s collection. It’s a great last achievement for a year that has set the band off into a future that’ll see them catapult into mainstream rock stardom. Mark my words. NEWS: Big Scary Monsters Records hold charity 5-a-side football event! NEWS: Twin Atlantic confirm support for October/November 2014 headline UK tour! 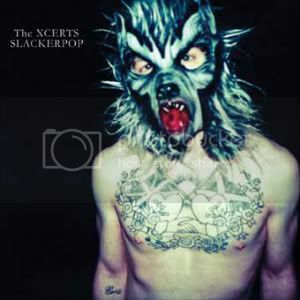 NEWS: The Xcerts release ‘Slackerpop’ as flexi disc single!